Find new ideas with our brainstorming tool - quick and easy with the click of a button. With just a few input words, you will generate lots of new words related to your topic and enjoy instant inspiration for your naming project. NameRobot's brainstorming tool is an idea generator which helps you get started and lets you find inspiration for your name. Feed the tool with words, and it spits out ideas related to your topic. You will find lots of ideas for your name with one click - you just have to decide which ones you like. The ideas generated by the brainstorming tool will be words and associations which are subordinates or superordinates of your input word, or have the same meaning. They may also be semantically related in a more distant way. Just as in a "real" brainstorming session, all ideas which come up are somehow linked to your keyword. These suggestions may also serve as fuel for your own imagination. The brainstorming idea generator not only finds obvious related words, but also provides results a human being might find only after further research. Sophisticated idea generator - a real time saver! With the brainstorming tool you can save hours of "real" brainstorming sessions with just a few clicks of a button. The tool provides you with ideas and words just like a normal creative session - only that it is much faster and so simple! The advantages are obvious: you can find ideas more quickly and do brainstorming sessions without the help of colleagues, friends or acquaintances. The tool kind of thinks on its own and generates unexpected ideas that you might not have come up with yourself. Test the Brainstorming tool now - for free! Give NameRobot's Brainstorming tool a try and test it for free. You can perform up to five checks with the tool to see how it works. Enter a single word and find lots of ideas and related terms with just one click. 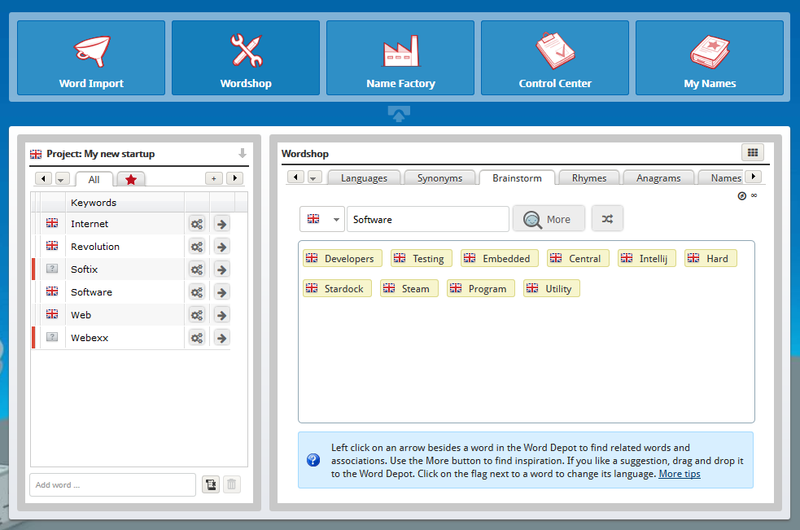 Go to the Brainstorming tool in the Wordshop right now to test it out! If you don't have a NameRobot account yet, simply register and start looking for a name!